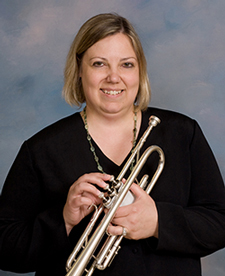 Christine Monteiro first played with the Kishwaukee Symphony Orchestra in 1986, when her father, Jack Wild, was principal trumpet. She performed periodically with the orchestra until joining as a regular member of the section in 2007. In addition to the KSO, Christine plays lead trumpet in Jazz in Progress, a local non-profit jazz band, and is a regular member of the DeKalb Municipal Band trumpet section. Christine holds a bachelor’s degree in vocal music performance from Northern Illinois University, and directs the Celebration Chorale and the Waterman Community Choir. While she enjoys performing a wide range of music, her favorite composers remain Beethoven, Mahler, and Shostakovich.